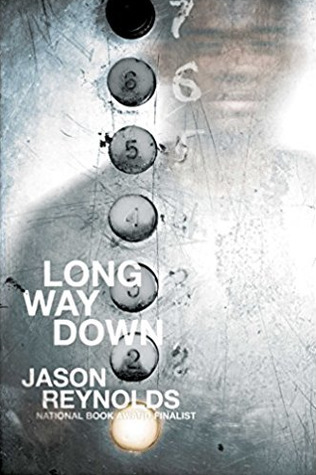 Fifteen year old Will is burning to avenge his brother’s murder, in “Long Way Down” (Simon & Schuster 2017) by Jason Reynolds. Most of the novel-in-searing verse covers about one minute of Will’s life. So, Will knows who killed Shawn. He’s sure of it. He finds Shawn’s gun in his drawer, tucks it in the back of his jeans: “felt the imprint/ of the piece, like/ another piece/ of me,/ an extra vertebra,/ some more/ backbone.” Will enters the elevator on the seventh floor on his way to get to the basement apartment—to the guy who did it. On the sixth floor Buck gets on. But Buck is dead. But he’s in the elevator, smoking. It turns out Buck gave Shawn the gun. He tells Will to check to see if it’s loaded. Will discovers one bullet is missing. Shawn must have shot the gun. Will didn’t know Shawn had ever taken a shot. On the fifth floor a really cute teenage girl gets on. She knows Will. Or knew Will. It turns out she’s the one that got killed by a stray bullet when they were about five years old and together at the playground. On each floor another person gets on. They’re all dead people. His father, who was killed in the neighborhood, following the rules. But then the next guy was going to follow the rules. And do you always pinpoint the right murderer? The chorus of ghosts consider this. Reynold’s author biography printed in the book is a heartfelt love letter to his readership, letting them know that he cares about them. First and foremost he is a young black author speaking to his young black readership. He addresses reluctant boy readers, saying he doesn’t like “boring” books either. He makes the point: if the books are exciting enough, boys will read them. The verse, besides driving the perfect percussive rhythm for the story, allows plenty of white space on the page and is highly accessible. The story and the driving verse makes this a universal read.